Pete "Bassman" Bain, one of the founding members of the UK cult psych rock band Spacemen 3, formed Alpha Stone after Spacemen 3 and his other band The Darkside split up in the mid-nineties. 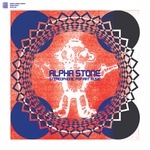 In 1996, Alpha Stone recorded the album Stereophonic Pop Art Music and it was released on Bomp! Records on CD. The album hasn't had a "proper" vinyl release until now. You can clearly hear that Pete Bassman was the driving force behind Alpha Stone; fuzz, synthesizer-sweeps, programmed drums, and processed vocals are the cornerstones in Alpha Stone's sound. Raga-like mantras, heard in "Farmer C", lies track-to-track with more percussion-driven grooves and psychedelic pop-oriented songs. The album's sound has obviously survived the 20+ years shelved in obscurity and proves the "Drugby" sound still vital.